There are at least five artists with this name: 1. A popular electronic music duo from France 2. A jazz trio from the United States 3. A noise rock band from Japan 4. An alias of ambient musician Pete Namlook 5. A pop group from the Philippines 1) The French band Air is a duo consisting of Nicolas Godin and Jean-Benoit Dunckel. They went to school in Versailles, (Lyc?e Jules Ferry) before forming the band in 1995 . Their critically acclaimed first album Premiers Sympt&ocirc;mes was followed by the release of Moon Safari, The Virgin Suicides (soundtrack), 10,000Hz Legend, and Talkie Walkie. 1) The French band Air is a duo consisting of Nicolas Godin and Jean-Benoit Dunckel. They went to school in Versailles, (Lyc?e Jules Ferry) before forming the band in 1995 . Their critically acclaimed first album Premiers Sympt&ocirc;mes was followed by the release of Moon Safari, The Virgin Suicides (soundtrack), 10,000Hz Legend, and Talkie Walkie. In 2007, Air released the album Pocket Symphony and Love 2 in 2009. The Seven Stars Songfacts reports that Air was commissioned to write a new soundtrack for the premiere of the newly restored Georges M?li?s' silent film, Le Voyage Dans La Lune, at the 2011 Cannes film festival. Despite M?li?s' film only having a runtime of 14 minutes, Air still produced enough music to fill an entire album, which will be released as their seventh LP on February 7, 2012. Although Air's music is often referred to as electronica or trip-hop and is often found in such bins in record stores, their form of electronic music actually owes more to the synthesizer sounds of the 1970s such as Jean Michel Jarre and Vangelis. Other influences that are more readily apparent than house and techno are psychedelic rock pioneers Pink Floyd and krautrockers Tangerine Dream (although there are some echoes of dance music styles in the production). Another influence is French crooner Serge Gainsbourg. Air's music also has jazz inflections at times, and their ability to improvise is more clearly highlighted in the live arena. Before they founded Air, JB and Nicolas played together in the band Orange, with others such as Alex Gopher, Xavier Jamaux and etienne de crecy names which have recently reappeared in connection with Air's remixes. The name stands for "Amour, Imagination, R?ve", which translates to Love, Imagination, Dream. Air uses many of their studio instruments (like Moog synthesizers, the Korg MS20, Wurlitzer and Vocoder) live on stage. The band performs the well-known tracks from the albums live as extended or altered versions. 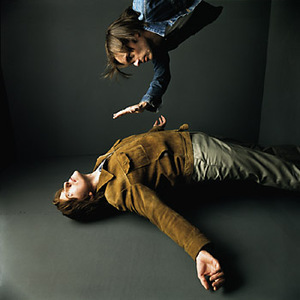 Air often works together, both in the studio and live on stage, with artists like Beth Hirsch (Moon Safari), Fran&ccedil;oise Hardy ("Jeanne"), Jean-Jaques Perrey ("Cosmic Bird"), Gordon Tracks ("Playground Love" and "Easy Going Woman"), Beck (10,000Hz Legend) and, on the 2004 tour, with Dave Palmer and drummer Earl Harvin. On their 2007 album "Pocket Symphony", more guest writer and vocalist appearances were made by Jarvis Cocker and Neil Hannon (of The Divine Comedy. For the 2007 tour that accompanied the record, the band consisted of Earl Harvin on drums, multi-instrumentalist Steve Jones (steviejjones) and French keyboard player Vincent Taurelle.